Dr. Richards attended Baylor University during his undergraduate studies, and received his DDS from Baylor College of Dentistry. He is passionate about serving his community both in and out of his dental practice. 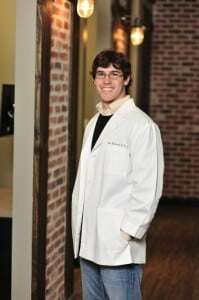 Though he has practiced dentistry at The Dental Centre of Conroe for two years, he has served his community’s dental needs for over seven years. With extensive experience in sedation and implantology, Dr. Richards dedicates himself to providing his patients with quality dentistry. He strives to surpass the status quo and promotes an environment in which every patient has access to comfort and comprehensive services. Known for his wonderful bedside manner and patient-centered focus, Dr. Richards’ greatest mission is to provide each patient, even those who have suffered negative experiences in the past, with an enjoyable dental experience. An empathetic dentist, Dr. Richards takes that passion for working with others into the community with charity work, both through youth work and as a deacon at First Baptist Church Conroe. He is also an active professional member of the American Dental Association (ADA) and the Texas Dental Association (TDA). When he is not transforming patients into dental enthusiasts, Dr. Richards enjoys spending time with his family, including his wife Alli, six-year-old son Canon, and four-year-old daughter Lila Ann. He also enjoys restoration, including renovating his 130-year-old home and working on vintage cars. When you’re ready to schedule your dental appointment with Dr. Richards, call the Dental Centre of Conroe today at (936) 441-4600. Located in Conroe, TX, we also proudly serve the residents of Houston, The Woodlands, Willis, Montgomery, Magnolia, Huntsville, and all the surrounding communities.